Download this white paper as it provides data centre owners and managers a simple framework for answering the question in the context of their own circumstances and requirements. Three options are explained and compared: run to fail, upgrade, and buy new. 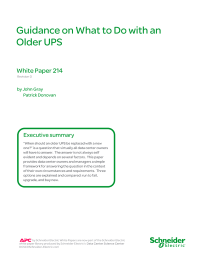 “When should an older UPS be replaced with a new one?” is a question that virtually all data centre owners will have to answer. The answer is not always self evident and depends on several factors. There is no one right answer, but rather a range of right answers depending upon various factors including what the current and future capacity, redundancy and efficiency requirements are, what the outsourcing strategy is, and what has already been provisioned for in the electrical and physical infrastructure supporting the existing UPS.